When halibut fishing anywhere on the West Coast there’s nothing more important than establishing a strong scent trail. Generally, down 300 feet where we fish it’s dark and the fish can’t see too well, so you want three things: sound, scent and a little bit of sight. For many anglers if you get one of the three you’re pretty happy. The scent is the most important. That’s the only one that travels far and covers the most distance. It’s no secret that many halibut seekers turn to whole herring or salmon bellies, but oftentimes that’s not enough. To stimulate more bites I prefer to marinate and brine these baits. The reason why I do both is simple. By brining the bait it makes it tougher. It makes it more difficult for the bottom dwellers to chew and more durable. Adding scent is vital. We want to marinate those baits overnight so the scent seeps out while it’s bouncing on the bottom. The more it seeps out the more halibut we draw in. The strongest scent I’ve found is Pautzke Halibut Nectar. And, for those that haven’t used it, it’s a liquid, not a sticky scent. Therefore, it’s imperative to do a 24-hour soak. I want my baits to look pink inside. This way we know the strong scent is going to remain in the baits as long as they are on the bottom. The Fire Brine is the vehicle we use to toughen those baits up. Here’s exactly what I do to make my halibut brine and put enough scent down on the floor of the Pacific Ocean to be successful. Place salmon bellies, herring and salmon leftovers in bucket. If you don’t have salmon bellies, it’s ok to use herring. You can find them for sale in most tackle shops. Large herring is always expensive (up to $2 a bait) so you want to scent it well and get the most out of each bait. Add a bottle of Natural Fire Brine. This is designed to toughen up your bait. You don’t want soft bait hanging around the bottom. 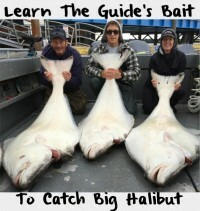 Soft bait gets chewed apart by small fish, which means you could have no bait while you think you are fishing for halibut. Add Fire Power (pure krill powder). Personally, I coat the top of the herring, normally using about a quarter of the Fire Power container. Keep in mind, all these fish are krill eaters. The smell of krill is attractive to them. It’s ok to use a lot of it. There’s been a lot of krill off the coast this spring. We know that because of the amount of whales and marine life offshore. Add Halibut & Rockfish Nectar. I usually add two containers, but I’m doing a big batch at a time. Two bottles is enough for a 5-gallon bucket. If you can’t find the Halibut & Rockfish Nectar locally you can get away with using Pautzke Red Nectar. Mix contents. I have a stick I’ll put in there and mix it. Then, I’ll put it in the fridge and let it sit overnight. I’ll let it sit about 18 hours and it’s ready to fish. You’ll be able to see the baits having absorbed the Nectar. Editor’s Note: Gary Blasi operates Full Throttle Sport Fishing. For more information on his halibut & lingcod combo trips out of Eureka, California, please visit http://fullthrottlesportfishing.com. California’s North Coast Halibut Open Now!